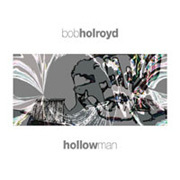 Bob Holroyd's pluralistic approach to music takes the listener to many corners of the world as well as to the sensitive interior regions of being. Hollow Man (49'05") is an album that dwells in the ambient elsewhere somewhere between the classic trip-hop of Mezzanine by Massive Attack and the cerebral pop of Music For Films by Brian Eno. The dramatic arrangements and shifting intensity of the more cutting pieces provide an expected aggressive stance - which is periodically softened by brief smooth areas of sincere ambient-inspired contemplation. This enticing sound includes the gritty drum loops, rumbling bass lines and squelchy guitar riffs found on more established dance oriented releases; but Holroyd makes this music his own by adding in exotic samples, ethnic instruments, ethereal voices, surprising digital manipulations and an uncluttered cinematic character. Hollow Man runs hot and cool, with glowing miniature soundscapes of reverberant piano keys, strumming acoustic guitar and fluid synth pads, placed strategically to chill the listening experience. What remains constant throughout this CD is its forlorn disposition. Somewhere in the midst of the music technology, Holroyd has found a way to express the nuanced human condition of yearning, and, by album's end, hope.